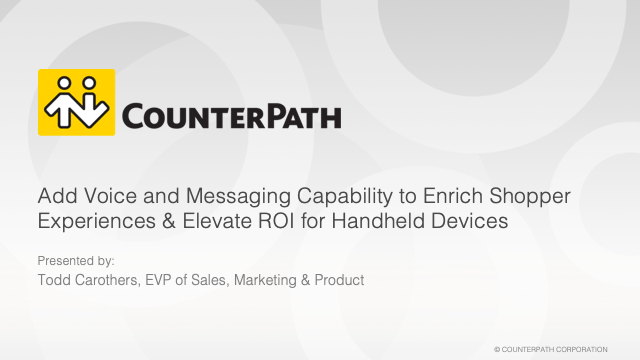 CounterPath Unified Communications solutions are changing the face of telecommunications. An industry and user favorite, Bria softphones for desktop, tablet and mobile devices, together with Stretto Platform™ server solutions, enable operators, OEMs and enterprises large and small around the globe to offer a seamless and unified communications experience across both fixed and mobile networks. The Bria and Stretto combination enables an improved user experience as an overlay to the most popular UC and IMS telephony and applications servers on the market today. Standards-based, cost-effective and reliable, CounterPath’s award-winning solutions deliver high-quality voice and video calling, messaging, and presence offerings to our customers such as AT&T, Avaya, Bell Canada, BT, Liberty Global, Ribbon Communications, Uber, and Vonex. Visit counterpath.com and follow @counterpath. In this age of instant gratification and rapid fulfillment, consumers expect to find what they want quickly. How can retailers become agile and quick-moving while facing fierce competition? While handheld computers, scanners and rugged devices are being used for inventory management and other functions in the retail environment, the path to higher organizational productivity and competitive edge, lies in transforming retail processes without having to reinvent the wheel. By empowering these devices with portable phone capabilities, retailers can future-proof their employee communications and provide a better standard of support to their customers. This webinar highlights how voice and messaging solutions when integrated with handheld computing devices improves communication, employee productivity and the customer experience. Learn how advanced voice solutions transform handheld computing devices into an extension of the existing corporate phone system. Incorporating voice and messaging functionality with handheld and scanning devices improves the ROI by delivering new and increased functionality. •How to remotely deploy and manage your voice and messaging solutions from a centralized provisioning platform, across popular handheld devices from Honeywell, Zebra, Datalogic and others. To paraphrase Paul J Meyer: “Communication is the key to success”. So in this day and age, why do so many businesses struggle with multiple, disconnected communication systems? Unified Communications (UC) can combine all of your communication methods into a single experience across multiple platforms, resulting in easier and more effective communications. But which solution is right for your business? Hanna Miller of CounterPath will outline trends in modern SMB communication, collaboration and mobility, and provide insight into how your business can benefit from cloud-based Unified Communication and Collaboration (UCCaaS) tools and services to streamline workplace communications and help solve your organization’s “Business World Problems”. The collaboration needs of small businesses have similarities, but often many differences, compared to those of larger organizations. Small businesses require the flexibility to support distributed and mobile workers, and to rapidly respond to customer opportunities and needs. To succeed, small businesses must employ a broad set of collaborative technologies enabling internal and customer communications, regardless of device and location. In this informative webinar we’ll provide insight into the collaborative needs of small businesses and how solutions including team collaboration and unified communications provides competitive advantages by improving agility, decision-making, and customer and employee engagement.